Christianity has, from its very beginnings and because of its beliefs and practices, had a paradoxical relationship to the world. This stimulating book, which contains articles by seven leading historians, argues that the relationship between the Nonconformist tradition in Britain and ‘culture’ provides a particularly illuminating example of this paradox. Nonconformists, set apart from the Established Church, developed their own particular cultural practices and in so doing made a distinctive contribution to the culture of Britain as a whole. At the same time, they were inevitably influenced by that wider culture. These essays consider the development of chapel and Dissenting culture within the wider society , examining such issues as the emergence of the Nonconformist conscience, the place of politics in the pulpit, the contribution of women writers to provincial Nonconformity and the architecture of the free churches. This fascinating and varied collection of essays goes beyond the usual boundaries of denominational and ecclesiastical history and interacts with broader trends in cultural and social history to demonstrate the significance of such matters as gender relations, politics and economics in any exploration of the relationship between Christianity and ‘the world’. 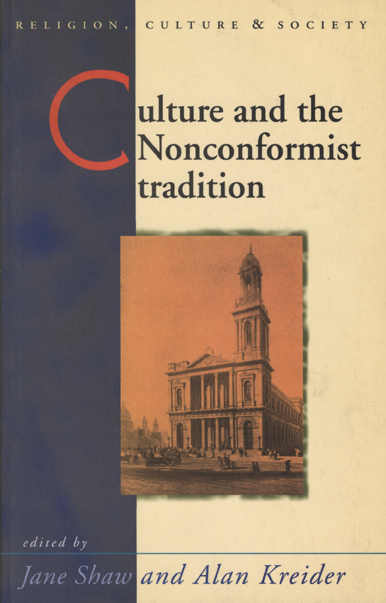 Introduction: why ’culture and the Nonconformist tradition’? Jane Shaw, Dean, Fellow and Tutor in Ecclesiastical History, Regent’s Park College, Oxford. Literary Women in eighteenth-century Nonconformist circles Marjorie Reeves, formerly Vice-Principal and Fellow and Tutor in History, St Anne’s College, Oxford, and is now Honorary Fellow of St Anne’s College and St Hugh’s College, Oxford. Methodism and motherhood Phyllis Mack, Professor of History, Rutgers University. Gospel and culture in Victorian Nonconformity David Bebbington, Reader in History, University of Stirling. Politics and the pulpit: Robert Hall and the ’Signs of the Times’ John Briggs, Principal of West Hill College, Selly Oak, Birmingham. Nonconformists, economic ethics and the consumer socciety in mid-Vicorian Britain John Garnett, Fellow and Tutor in History, Wadham College, Oxford. Dissent and the peculiarities of the English, c.1870-1914 Hugh McLeod, Professor of Church History, Universitu of Birmingham. Victims of success: twentieth-century Free Church architecture Clyde Binfield, Reader in History, University of Sheffield.